Mingle with your fellow bike, and car enthusiasts and check out the rides on display, including special guests 365 Jeep Life. Enjoy Irish food and drink specials (including a $5 Shamrock Lemonade made with Key Lime Vodka), live music and more. Reserved parking for bikes going to and from Daytona during Bike Week 2018. Free admission. Visit acecafeusa.com for more info. $5 Jameson. Visit AlomaBowlingCenters.com/boardwalk for more info. This FREE three-day festival runs March 16-18, and includes Highland Games, Irish Grub, Live Celtic Music and more. Visit the event’s Facebook page for more information. They will be opening at 9am on March 17, serving authentic Irish food all day. Live entertainment featuring Pete Pasha, Auld Sods, and Irish Dancers starts at 11am. Visit fiddlersgreen.pub for more info. Celebrate the Irish-themed holiday with a Mexican flair. Drink specials include: Jameson Irish Whiskey and Maestro Dobel Tequila (barreled exclusively for Frontera Cocina) Shot Flights $12; Green Modelo Especial Drafts $6; and Frozen Avocado Margaritas $12. Visit the event’s Facebook page for more info. And if you’re having a celebration at home, Krispy Kreme Doughnuts is offering their original doughnuts with a green glaze March 16-17. Central Florida locations include Millenia Mall, Kissimmee, Winter Park, and Daytona Beach. 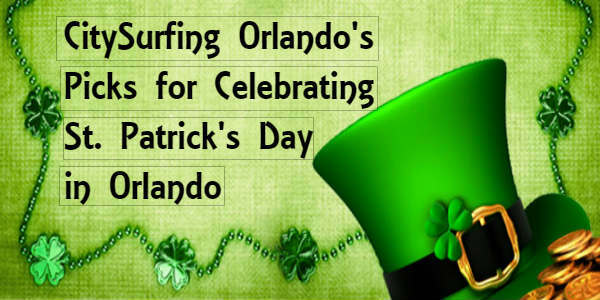 Free and open to the public, guests are encouraged to dress in green as they celebrate outside Liam’s and Colonial Town Park plaza neighbors: Graffiti Junktion, Dexter’s of Lake Mary, Duffy’s Sports Grill, F&D Cantina and Corona Cigar, with continuous live entertainment (Young Guns, Orlando Firefighters Pipes and Drums, Irish Dancers and more), authentic Irish cuisine and drink specials all event long. Plus, Liam’s block parties support Just Our Soldiers’ Helpers Inc. (J.O.S.H. ), who will be on site collecting donations. Visit liamfitzpatricks.com for more info. From noon to 2am on March 17, enjoy Irish food and drink and dueling pianos. Off Kilter plays in the evening. Admission is FREE until 7pm for all ages. After 7pm, 21+ only is $10 per person or $15 for VIP (private bar, light appetizers, & balcony access). Visit universalorlando.com for more info. Enjoy Irish bands, dancers, food and drink all weekend long for St. Patrick’s Day. Admission is free March 16th and 18th, then on March 17, guests are seated on a first come-first served basis with a cover charge of $10 per person 18 and older. Visit raglanroad.com for more info. Special lunch menu on March 17 includes corned beef brisket, choucroute, potato salad, house- made irish soda bread, joyce’s mustard and chocolate stout cupcake with bailey’s buttercream for dessert, all for $18/person. They’ll also be releasing their Dirty Ole Stout. Visit the event’s Facebook page for more info. Enjoy a Corned Beef & Irish Cheddar Slider for $14 (1/2 price from 4-7pm), along with an Irish Mule for $14. From March 15-18, you can also enjoy Guinness Braised Lamb Shank with colcannon potatoes, cabbage, a Minted Lamb Jus, and Coffee Mousse filled Mint-dusted Donuts with white chocolate-Baileys fondue dipping sauce. Visit urbain40.com for more info. The block party kicks off March 16 at 8pm with live music from The Adam Moreno Project, Rosie O’ Grady’s Highlanders Pipes & Drums, and DJ Jorge. Then on March 17, the party starts at noon with live music from Seven Nations, Audio Exchange, Rosie O’ Grady’s Highlanders Pipes & Drums, and DJ Korndogg. Drink specials both days. Visit wallstplaza.net for more details. There are also plenty of other options listed in our events calendar, if none of these appeal to you. But however you choose to celebrate, please drink responsibly and make it home alive!